The hero in video games can take the form of many guises – they may appear as Italian-American mustachioed plumbers, or those dressed like Peter Pan sent hurtling back and forth through time and even animals such as Bear’s and Squirrels. But back in 1990, the makers of Kickle Cubicle thought differently and set aside a hero who wasn’t a plumber, or dressed all in green, no they decided the hero in this game would be a character wearing black dungarees and wearing red Dr Dre beat headphones – and whyever not? Developed by a company called IREM, makers of quality hits such as the video game adaptation of Hook and the more impressive R-Type, how does this game fare this days, could Kickle have been the hero this video game city deserves and needs? Kickle Cubicle is classed as a puzzle game, but as well it can be seen as an arcade based game as well that wouldn’t look out of place in the arcade halls of the late Eighties early Nineties. You control Kickle, who according to the background story wakes up to discover his kingdom is covered in ice and that the King has imprisoned people in so called “dream bags” to which you have to rescue these people from each level to progress to the next level. How do you do that I hear you ask? Well, the levels are set in an overhead perspective, to which you see the red dream bags glowing that you need to collect. 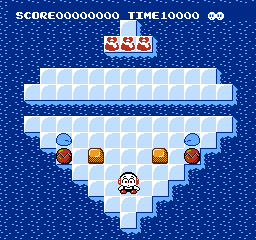 On the icy levels are spaces in the ground to which you need to freeze the enemies on screen with your icy breath, and push them towards the gaps in the ground, that gives you the ability to walk across the squares to collect the dream bags. Along the way you’ll find enemies that although can be frozen, they cannot be pushed as icy blocks, you can only destroy them. There are four lands in the game that you need to complete – Garden Land, Fruit Land, Cake Land and Toy Land, all of which at the end you need to defeat a boss to progress. Once this has been completed, you unlock the special game mode which has 30 challenging puzzles that need to be completed. So there is a lot here to keep the player going, getting your money’s worth (unlike Mario in which that can be completed in 5 minutes!). 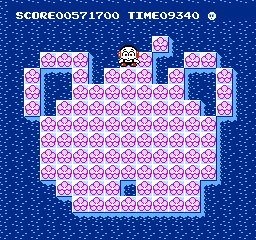 There is also a bonus stage that first is encountered on Garden Land, which takes the guise of a ring that appears on screen at a random time. This takes you to a level that’s full of flowers which give you extra points, so try to collect them as quickly as possible as they are only on the screen for a limited time. The controls for the game are quite simple – the d-pad moves Kickle, the B button makes Kickle blow his icy breath that freezes the enemy whilst the A button creates an icy pillar on that particular square. The use of this is that if you need to guide an enemy to a certain location, then raising these pillars blocks the enemies path, which makes it easier for them to go in a direction you would like them to go in. So the controls are simple yet effective, you don’t need to press the d-pad in certain ways whilst holding the other buttons to do something that might be deemed crucial to the game. The music in game is quite upbeat and jolly, and on the first level of Garden Land it reminds me of the music from Simon’s Quest – no matter the faults of that game it had some decent music. There are differing sound effects such as when Kickle dies and when you freeze enemies and push the blocks into the sea, so again it’s a game that doesn’t require muting and sticking on the latest Culture Club record to drown out the noises. The graphics is one of the game’s strongest points – the colours are bright and vivid and makes a nice change to the game pallette rather than using pastel greens and browns that often look turgid. Even when you complete a level and are surrounded in a circle of vegetables, the contrasts between say the orange of the carrots and the blue of the sea are striking and is a fine game graphically for the console. Bearing in mind the length of the game, with 4 differing worlds with multiple levels in each world AND the fact there is a special stage with 30 additional levels, you certainly get your money’s worth with Kickle Cubicle. Seemingly having learned from other long games in the past that didn’t have any form of save system or passwords, there is a password system so you don’t have to play the game in one sitting and can go outside and smell the sea air, or nature at its finest giving your eyes a break. The password can be entered on the main menu, though for some reason they omit vowels from the codes, relying on the consonants instead like a really bad round of Countdown. 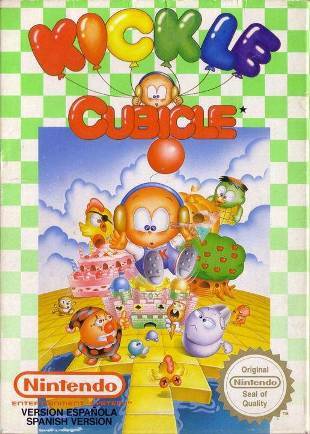 The game will make you think, and at times will make you curse like a sailor and throw the controller on the floor, but in Kickle Cubicle’s case it is in a good way and not frustratingly bad like in Turtles or Silver Surfer both for the NES. The controls are basic yet responsive and the colours make it a more colourful title for the NES library. The one drawback is that it can seem quite repetitive in freezing enemies and pushing the icy blocks around to collect the dream bags however that is the one drawback in a solid title. Copies in the wild seem bountiful and a PAL copy isn’t that expensive – as well do check your good local retro game store (links to stores in the UK are on the top navigation bar), so if you do get the opportunity, do pick up a copy of the game. It’s certainly one to while away with in the wee hours, I mean who wouldn’t want to assist the hero who wears such funky Beat headphones? When the NES was launched, one thing that stood out in the launch titles of their games was the use of the black box design. Marking on the failures of games released in years prior to the black box games, the NES games had an enlarged pixellated picture of the game you was about to play, rather than using photo realistic graphics on the game labels, and large bold lettering. 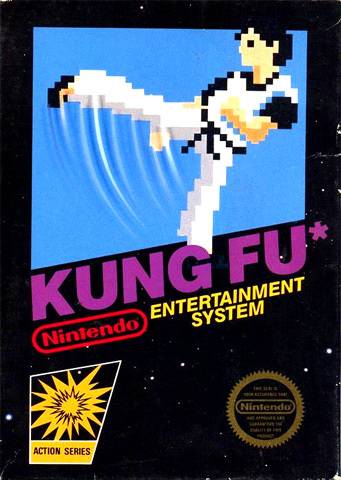 The most well known of the black box games would be Super Mario Bros, however in total there was at least 20 games that had this design for the games, and one of the better black box games was Kung Fu, a port of the arcade game Kung-Fu Master that was released on the NES in Europe in 1985. So after all this time, how does this early beat-em-up game compare to its peers, is it more Chop Kick or more Chop Suey? 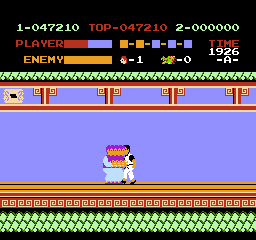 In Kung Fu, you take control of Thomas, a fine young man who as per normal video gaming folk lore, has to rescue his own princess by the name of Sylvia. Is she locked up in a high towering castle guarded by fire-breathing dragons, knights in impenetrable armour and a staircase that would cause anyone to pass out through exhaustion? Well no, but on the 5th and top floor of the wonderfully named Devil’s Temple. Anything that is called that can’t be good surely? It would be simple if you could take the lift up to the fifth floor, but then we wouldn’t have this video game if it was that easy. To get to your beloved, you’ll need to use all of your kung fu skills, encountering a variety of enemies and finishing with the final boss. That doesn’t sound too bad, does it? Turning on the game you have the option of choosing Game A or Game B, for 1 or 2 players. The difference in the two game modes seems to be that in mode B, you face more enemies making your quest to reach Sylvia that much harder. 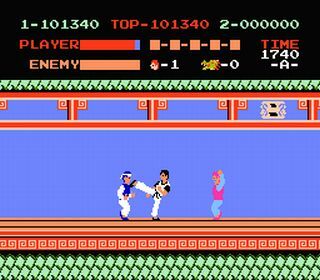 When selecting the 2 player option, unfortunately it is not both players on the screen at the same time, but similar to Super Mario Brothers in which you take it in turns to complete the level, so it’s nice to have that little bit of competition seeing who can go further in the game without losing lives and really who is a Kung Fu master. You’ll also notice the lack of music on the menu screen – it seems with other black box titles your treated to some jaunty ditty to set you in the mood. So has this be forgotten about for Kung Fu? Fear ye not, for when you choose your game mode, your treated to a short, opening themed music and then away you go with Thomas. The idea is to go from one side of the screen to the other, stopping you on each level is a number of different enemies that get progressively more difficult as the game goes on. On the first level for instance you encounter relatively mild thugs who want to hug you, draining your energy bar, and also knife wielding thugs hell bent in stopping you from completing the level. In later levels you encounter enemies that drop from the ceilings and from the sky, dragons appearing from the balls that drop and snakes that crawl along the floor, so a variety of enemies to tackle on with your mad skills. At the end of each level you’ll encounter the level bosses – it’s not always immediately clear how to defeat the boss. For example, without giving too much of the game away, the boss on the third level if you try punching and kicking his body you’ll do hardly any damage, you’ll need to find his weak spot. It certainly is a nice challenge after each level to work out to defeat the boss without the need for solidly mashing buttons. Speaking of mashing buttons, the controls of the game are incredibly simple – the A button is used as a punch and the B button kicks. You can also jump with up button of the d-pad and pressing the A or B button provides a jumping punch and jumping kick which can be more powerful and useful for certain bosses *ahem not level 3 boss ahem*. You can also duck and attack, with the down d-pad button and A or B. The controls are fluid and responsive, and makes it easy to attack swarms of thugs that approach you on each level. The music in the game is in an Oriental style that fits the game perfectly, making you feel like your making your way through the temple and set in China or other Far Eastern locations. The sound effects are relevant for the game, a differing noise for when you punch to when you kick. The music and the sound effects in the game are good enough so that you don’t need to mute your television when playing, it seems to enhance the game. One of the gripes about modern gaming is the lack of originality in mainstream games, with limited innovations in gameplay and mechanics, seemingly just updated teams and the same brands churned out. Football fans have FIFA, golf fans have Tiger Woods, and for a number of years, wrestling fans have had to contend with the WWE to experience wrestling on their consoles. Although there is nothing wrong in emulating WWE superstars, it’s nice to look back before licensed names and brands, to a time where the imagination was king and wrestling fans didn’t have the brawn and might of the biggest name in wrestling. Gamers had to contend with whatever characters the big N threw their way. 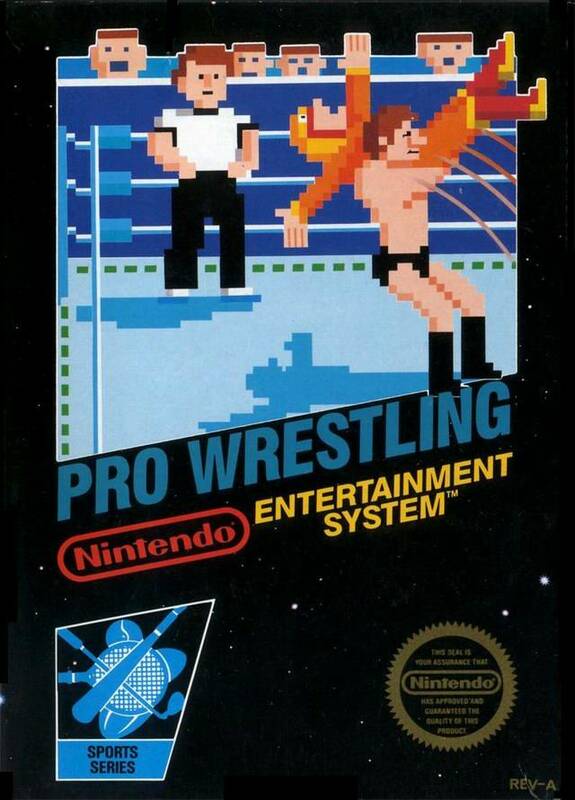 One of the earlist wrestling games for the console was Pro Wrestling, and although technically it was the second wrestling game in the NES library after M.U.S.C.L.E, so is this game down for a 1-2-3 count or is it one to beat violently with the back of a chair? Fighter Hayabusa, Star Man, Kin Corn Karn, Giant Panther, The Amazon, King Slender. There’s a star man, waiting in the sky… Is this who David Bowie imagined of? At this stage, without knowing the strengths and weaknesses of each character, at the start it’s a question of picking who you like the look of. Maybe your taken by the All-American-Hero looking King Slender, or part piranha (supposedly) part man The Amazon. 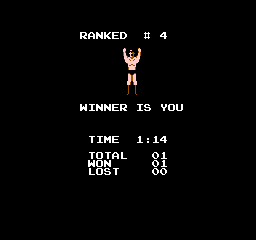 So you pick your character and away you go, ready to start your journey towards becoming the VWA (Video Wrestling Association, obviously) champion and becoming a legend amongst NES gamers. So as you start the match, you’ll notice that for a NES game, the settings in-match look quite detailed. You have the crowd cheering you on fist pumping in the background, and within that crown in the middle you’ll notice the two commentators dressed in black. You have the cameraman at the bottom following all the action and inside the ring you have the ref making sure it’s a fair fight. He will lay down next to you counting upwards when one character is being pinned, and will run over to you rather than just lay down on his stomach the moment you pin. The idea, either by skillfully pressing the buttons in a rhythmic way at the right time (or by button mashing like a true hero Track and Field style) is to wear down your opponent enough so that when you pin them, the ref counts to 3 and the match is over . You can even venture out of the ring to brawl like some street hoodlum but be careful, if the ref counts to 20 and your still out there you lose whereas both of you are out there, well, you both lose. However when you win, your treated to your man, arms aloft proclaiming “WINNER IS YOU”, not the worst example of Engrish but nevertheless one of those who love poorly translated Japanese. So with your trusted fighter you climb up the proverbial wrestling ladder fighting each character until you reach our friend King Slender, for a shot at the title. To get this far you’ll need to have been good, but now you’ll need the reflexes of a bumblebee with a dodgy stomach finding the nearest lay-by to relieve himself in. 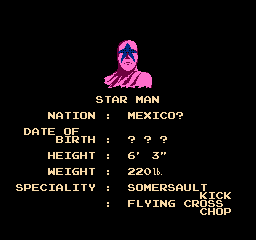 So for a NES game the game is colourful, and the characters are drawn well enough to distinguish them between each other, making it easy to relate to the wrestler you’ve chosen and have a favourite. 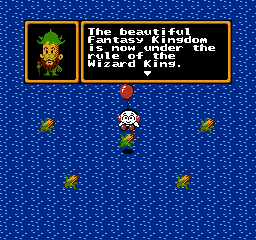 When you turn on the game your treated (as most of the early NES games) to a jaunty opening music before you choose your character. In game the music is the same 4 seconds looped but does throw something different every now and then. The sound effects, well it’s the same sound effect should you kick or punch your opponent, or body slamming them onto the mat. There are slight variations in the sound effects and it’s good enough that you won’t need to mute the TV to put on your latest One Direction LP or whatever the youth of today listen to. 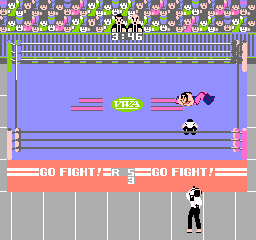 For those not in the know about wrestling video games or for the NES system having simple controls such as one button to run and the other button to jump, the controls are quite advanced and set the precedence for other wrestling games in how the matches are fought. The A button kicks and the B Button does a punch, though with Kin Corn Karn he’s unique in performing a vertical kick like nothing you’ve ever seen before and B does a jumping chop, which is as close as I’d get to explaining it. But where the beauty of the controls lies is when you grapple your opponent (by walking in to them), when pressing a direction and either the A or B button, it performs a different move. For example, in a grapple holding up on the d-pad and pressing will do a suplex, or down and A will do a pile-driver, but only if you’ve worn your opponent down enough – if you haven’t then your character will struggle, and your opponent will reverse the move. So it’s fun to change your character and mixing up the combinations seeing what moves the characters perform. Each character has their own special move too so get to work on those combinations. And finally, as per all good wrestling games should let you to, you can climb onto the top turnbuckle to perform an aerial attack, but don’t miss your opponent otherwise it’ll leave you worse for wear to say the least, like quaffing those Jaegerbombs I hear the youth consuming these days. Me, the winner? Oh no, not me – the winner is YOU!